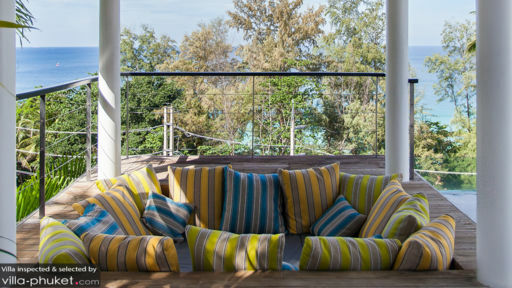 Designed with an art deco aesthetic celebrating the colorful lifestyle of Thai heritage, Villa Sammasan in Suring close to Surin beach and with endless views of the Andaman sea, is a three-bedroom private retreat with modern décor and well-appointed spaces with lavish layout, rich colors, and excellent furniture. With the master bedroom taking up the entire floor, you have the privacy you need and still get to spend time with everyone else around the infinity pool and the sunken seating around it. The master bedroom at Villa Sammasan is located on the upper floor, in its own private enclosure so that guests can enjoy a bit of exclusivity while they’re here. The bedroom features a contemporary bed with a four-poster structure. It overlooks the gorgeous view outdoors including the ocean and the greenery that you can enjoy all day. The en-suite bathroom is equipped with a spa bathtub which has access to the same kind of view all day every day! The other two bedrooms are furnished with a double bed that lights up at the foot for an enchanting ambiance and singles, decorated in a nice fashion with colorful art and simple décor. The teal and deep red tones of these two bedrooms truly speaks to the island living of Phuket. Each bedroom has an en-suite bathroom with ample amenities. Living on the edge was never so literal! 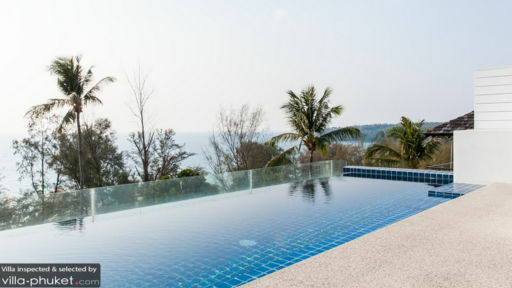 At Villa Sammasan you have a lavish infinity-edge swimming pool with a mosaic-tiled floor which overlooks lush vegetation and the ocean in the distance. With the pool deck furnished with sofas, chairs, and sun loungers for relaxation, you can spend hours idling away beside the pool, under the sun, with a drink or few. 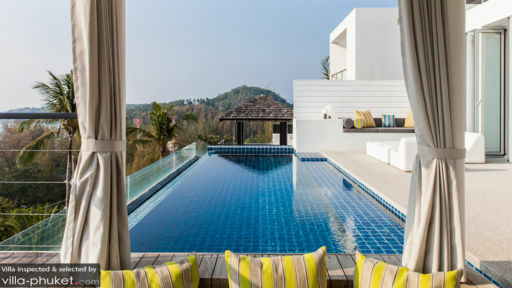 At one end of the pool, there is a traditional sala which houses a sunken sitting area with cushioned benches, numerous pillows in a variety of colors, and a killer view to make a great space for everyone to relax and take in the beautiful surroundings. The villa offers a few tastefully designed spaces for common meeting ground for everyone staying there including a gorgeous living area with faux leather couches, stuffed with the softest of fillings for a remarkably comfortable spot to spend hours lying on. There is a great piece of art hanging on the wall to add a vibrant touch to the otherwise pristine living room. Glass doors allow for ample natural sunlight that douse the room in a lot of light and leave it airy. Another room is the media space with plush couches, and a massive TV for entertainment. All these spaces are air-conditioned for a cooling ambiance. Beside the pool, you will find glass doors that slide open to a dining area which houses a stunning dining table with benches as chairs. Another dining space with a large table and vibrant yellow chairs can be found right in front of the open kitchen. The kitchen is fully-equipped to allow you to cook as per your wishes. There are corners with bean bags and soft curtains to make for excellent reading spots for guests, as well as arm-chairs to curl up on with a good book! The beautiful décor will definitely put your mind at ease and you are sure to feel welcomed and at home at Villa Sammasan. There is regular housekeeping and maintenance of the villa for the convenience of guests. At an extra cost, you can request for the chef to prepare delicious meals for you as well. There is personal guest assistance, at added cost. The villa is, in fact, surrounded by ample restaurants and beach clubs to keep you entertained. Laem Singh beach is also in the vicinity where you can feed marine creatures, ever so gently, and indulge in some super water activities! Enjoy a delicious drink and food at Catch beach club or explore more of the island to discover hidden gems like mini golf etc.